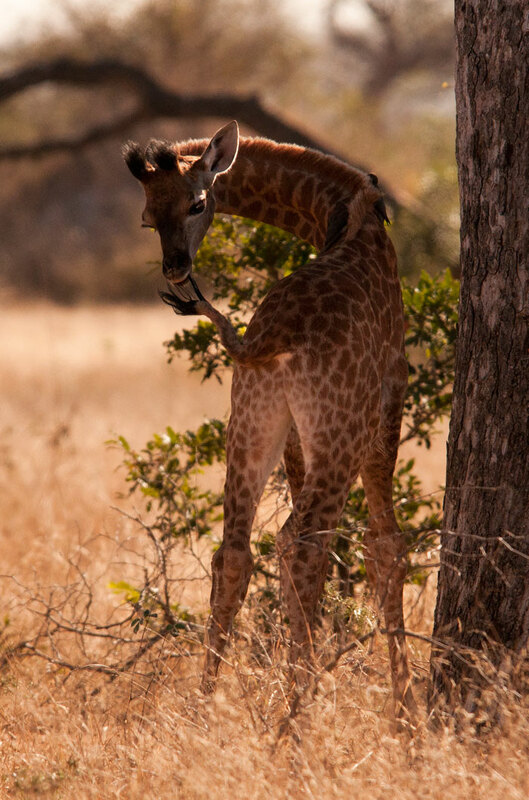 A giraffe calf playfully chews its tail. 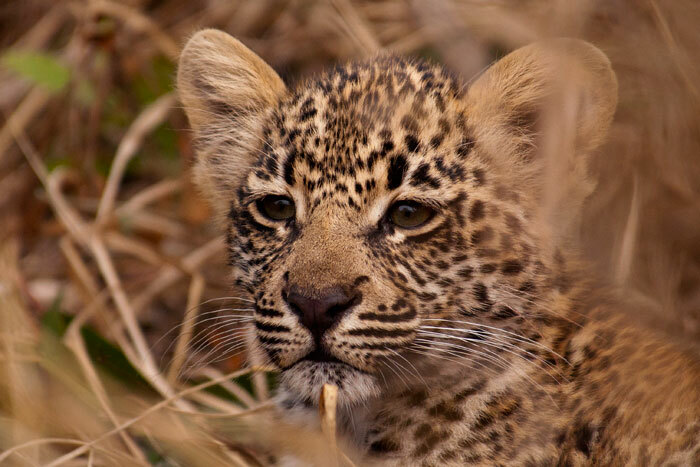 This youngster is only about three weeks old and has been seen frequently close to the camp. 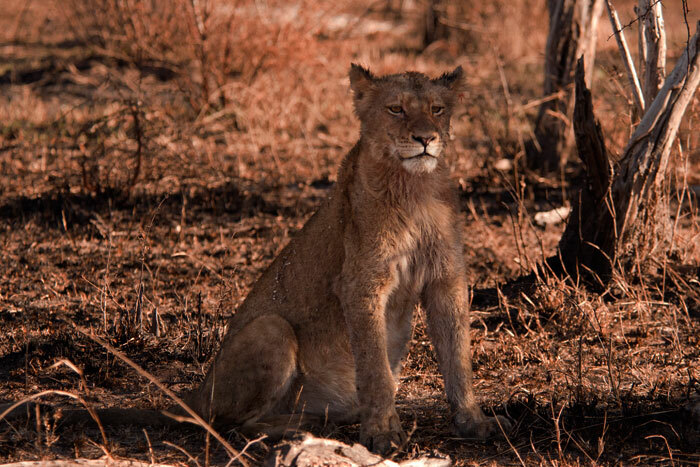 A very full Southern Pride youngster contemplates her move to the next shady spot. 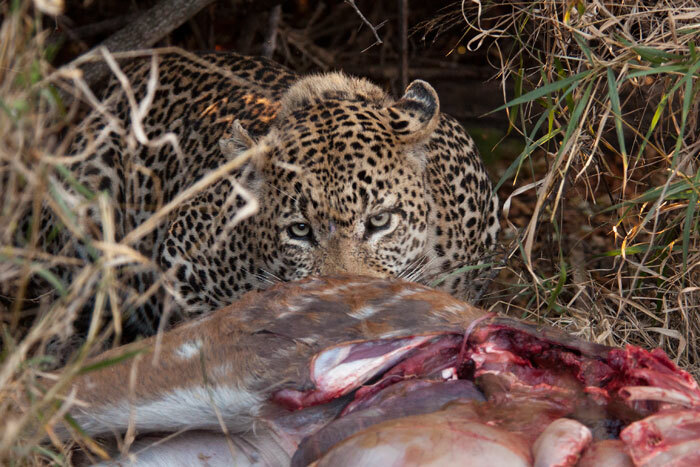 This pride of 12 was seen for about five days on Londolozi this week, and on this morning had clearly killed and feasted on something large the night before. 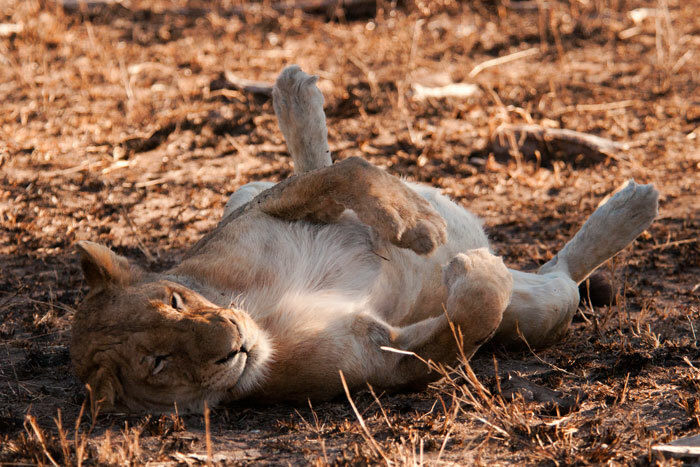 One of the Southern Pride lionesses uncomfortably shifts her position on a very full stomach! 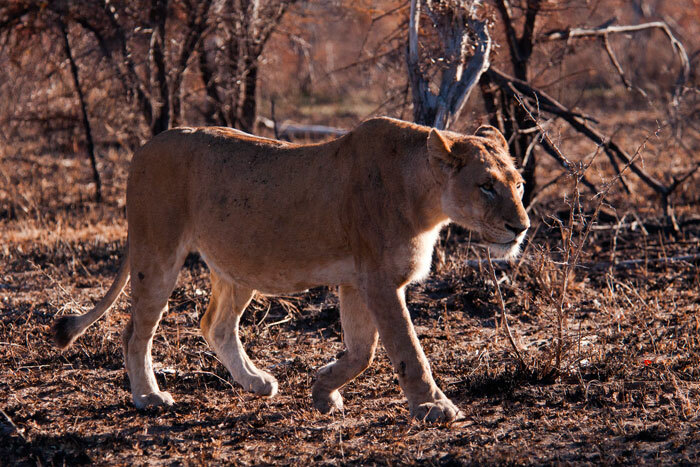 When a couple of the lionesses walked to find more shade, we noticed that at least of 2 of them are heavily lactating, implying they are pregnant. 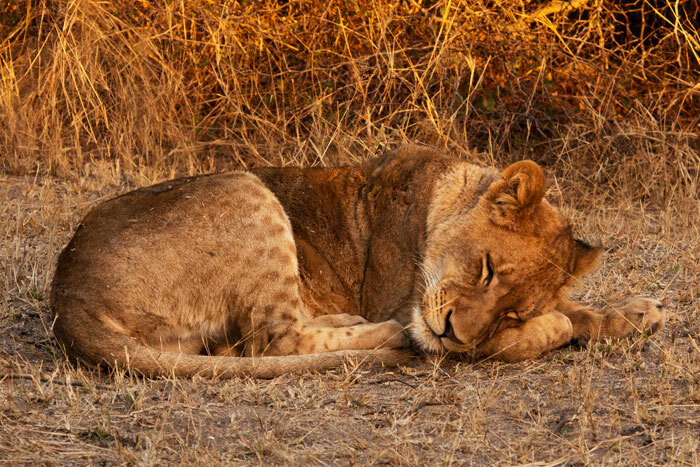 The previous evening, we had seen the Pride with another lioness who had two tiny cubs! It seems their mother took them back south that night, however, so we didn’t see them again. 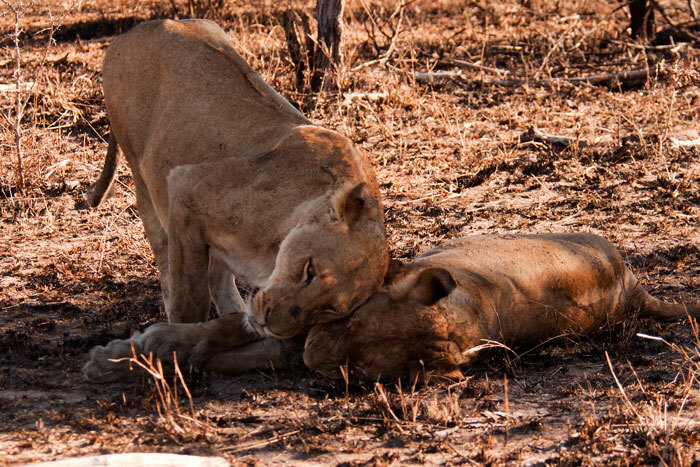 Two of the lionesses – presumably sisters – greet affectionately before napping together. One of the lionesses basks in the sun. 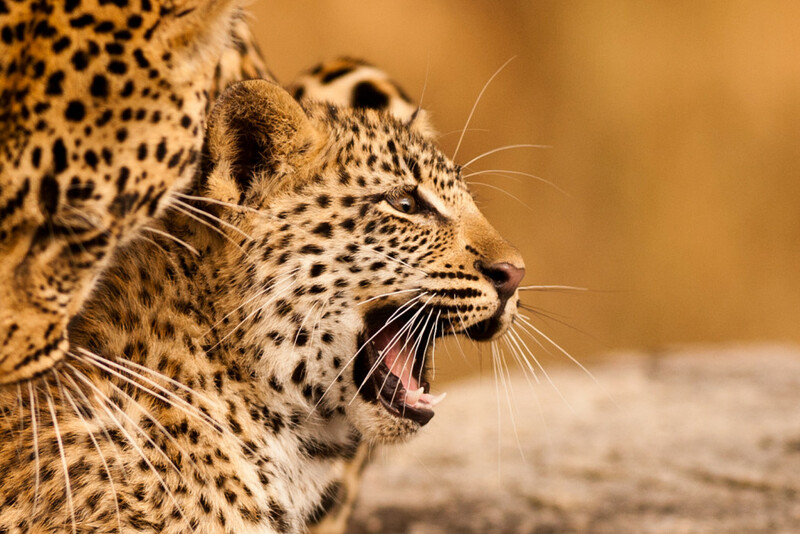 We are hoping to start seeing more of this large pride on Londolozi! An elephant cow drinks next to us. What happened afterwards surprised me: she sucked water into her trunk, but instead of drinking it, sprayed it at our vehicle! Twice in a row! It was a playful gesture which was definitely a first for me! Her calf followed suit in drinking, but did not attempt to douse us as its mother had. Another cow from the herd came close to investigate us, smelling into the air and holding out her ears. 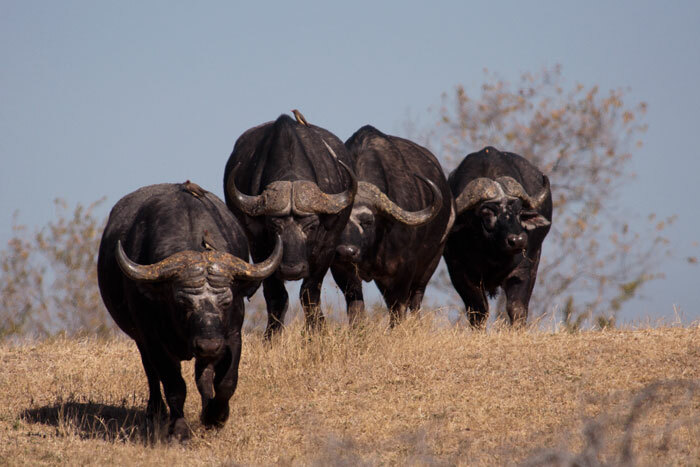 A group of buffalo bulls approaches a waterhole close to camp. During the dry winter months, it is sometimes advantageous to sit near a water source and wait for the animals to come drink during the day. 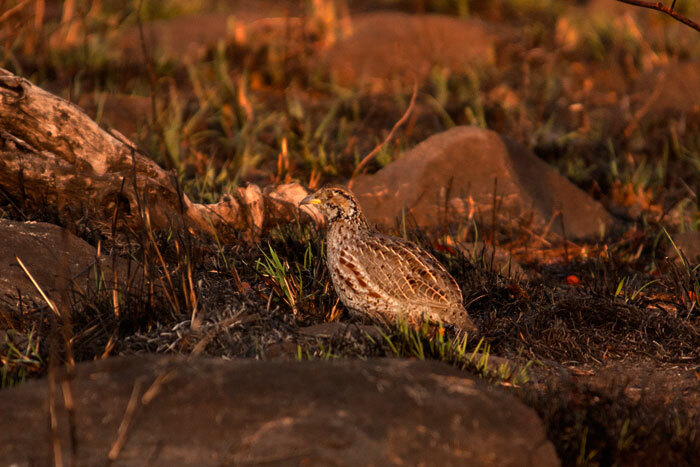 An often heard but rarely seen bird, the Shelley’s francolin frequents rocky areas, blending in nicely to its surroundings. 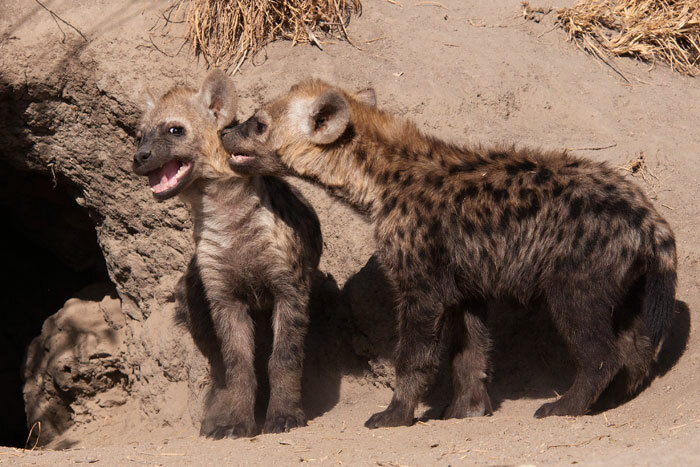 Finally, the hyena densite was active again this week! Despite numerous visits to the den during the past couple of weeks, we were not lucky enough to view them because our timing of the mother being at the den was off. Very late one morning, we thought it was a long shot they would be active in the warm weather, but indeed the 2 youngsters and their mother were there. They are getting bigger and braver, and were clearly having issues with sibling rivalry! Sometimes the play became a bit rough. 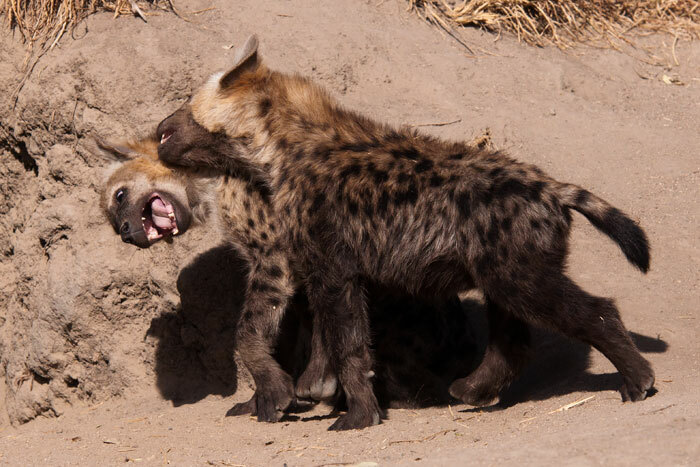 This is typical of hyenas, however, as there is usually a lot of competition amongst siblings. It can even be taken to the point where one sibling will kill the other one – a behaviour called siblicide. Luckily these two didn’t take it that far. 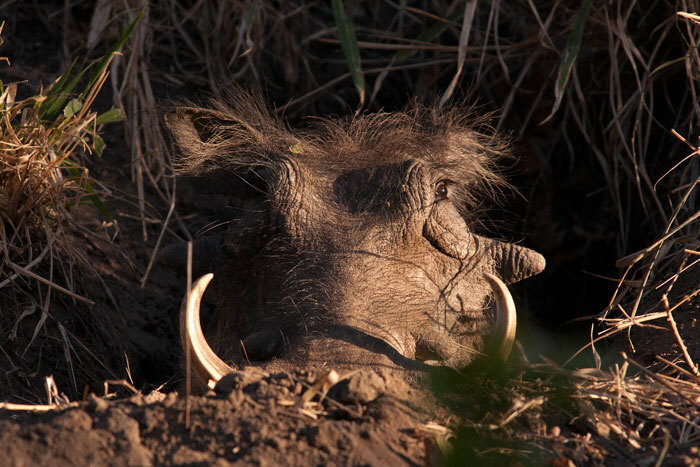 A large warthog rests in his burrow, a hole dug into the side of a termite mound. They typically spend their days foraging outside, and return to the burrow to sleep at night, after having backed in like this to keep an eye on any predators which may be lurking outside. One of the highlights of the week was a brilliant sighting of the Dudley Riverbank cub. Her mother, the Dudley Riverbank Female, had caught a scrub hare, and brought it to the youngster. Despite looking very thin herself, she allowed the youngster to consume the whole thing. She fed while hidden in a thicket, but then came out afterwards, giving us the best view I’ve had of this beautiful cub! Every time we are lucky enough to see this incredible creature, I learn something new. I had assumed that she would be shy without her mother between us and her. 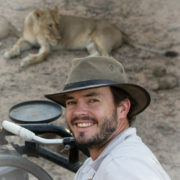 However, on this day the mother moved off to lie under a bush, but the cub came to investigate our vehicle. She came much closer than I expected, curious and confident. 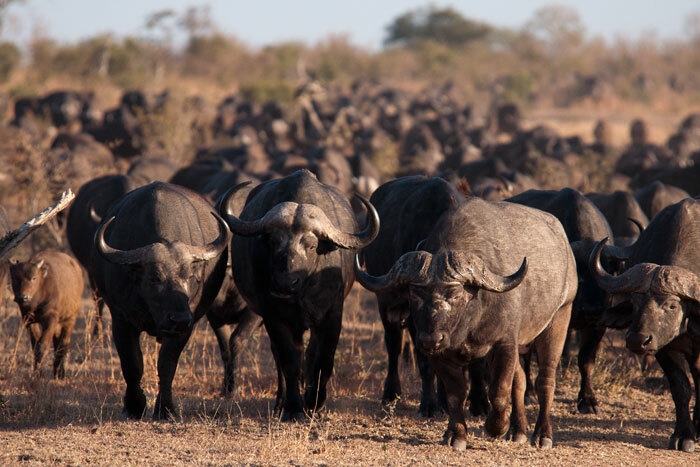 The large herd of buffalo moves steadily towards water. They are water-dependent and must drink at least once a day. On this morning they basically stampeded towards an old water source which ended up being dry, but continued on about 5km to the next water. One of the two remaining Tsalala youngsters curls up in the cold as night starts to fall. We would have a fantastic sighting of them as they hunted later that evening – unfortunately for them missing the kudu, but then having a loving reunion of the four lionesses afterwards! The best sighting this week for me was watching the first moments of a newborn elephant’s life. At dusk, we happened upon a herd very closely bunched together and edgy. We knew something was happening and watched as they eventually split and this little one appeared. 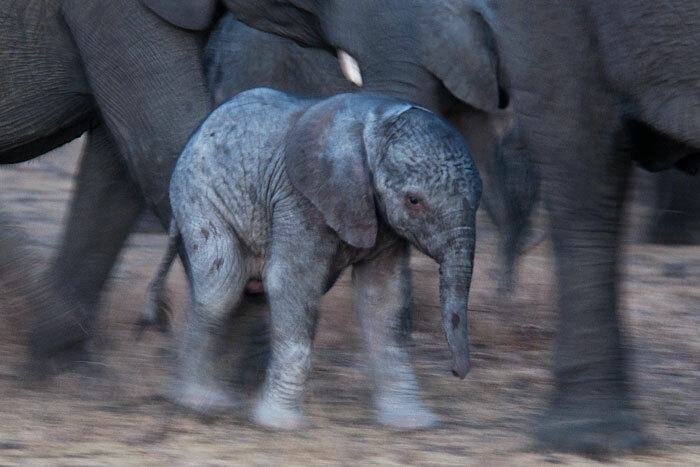 The hustle and bustle of the excited herd was a stark contrast to the calm youngster who slowly tried to gain his feet and follow his mother. The herd was extremely relaxed with our presence and moved towards us, feeding and allowing the little one to lie down next to us. 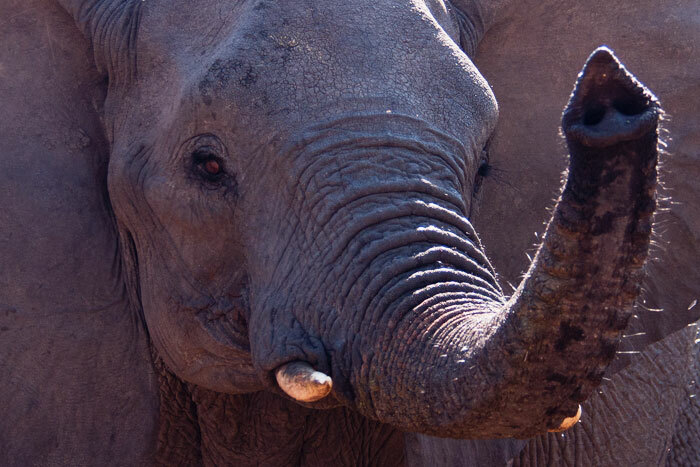 The mother slowly moved off, and then we watched as two younger elephants – presumably siblings – came and gently bent down and picked up the baby to its feet using their trunks and heads. I have heard of such behaviour in elephants but never witnessed it firsthand. 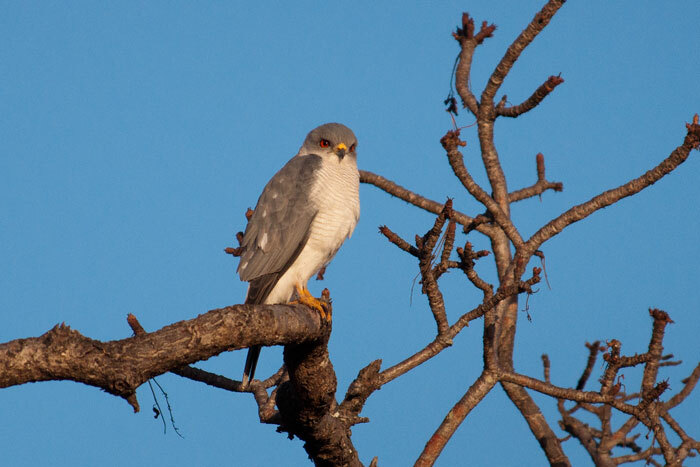 A Little banded goshawk, or Shikra, looks for prey beneath. 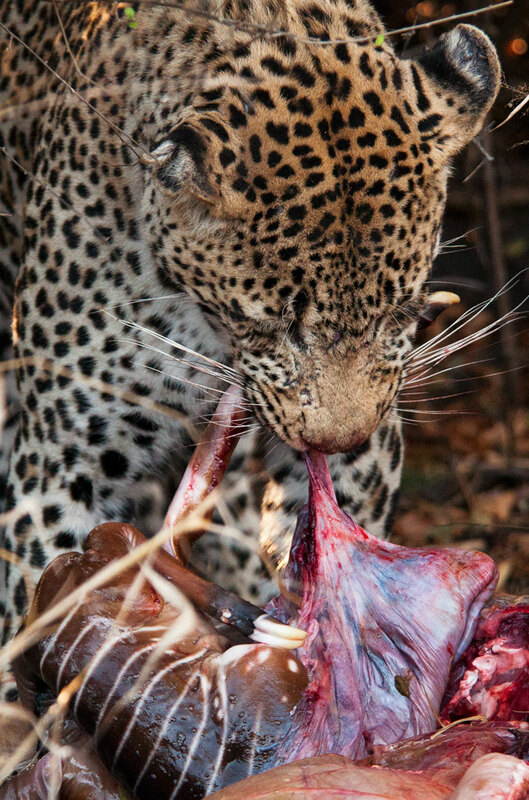 Another incredible sighting we had this week was of the Marthly Male, hours after he had killed a nyala. 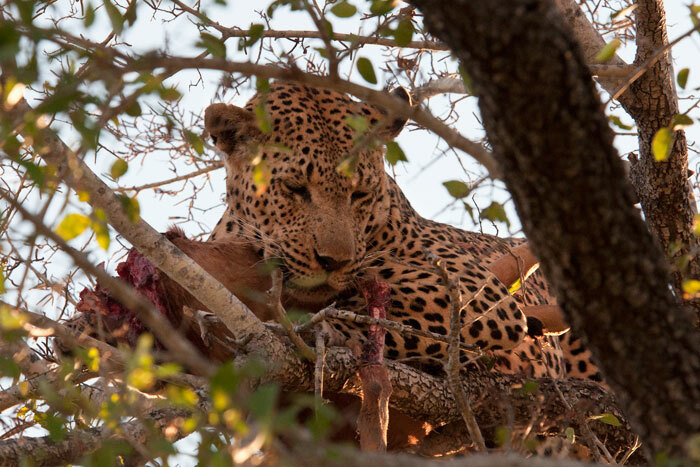 He was feeding in the early afternoon, the kill being too large for him to hoist into a tree. 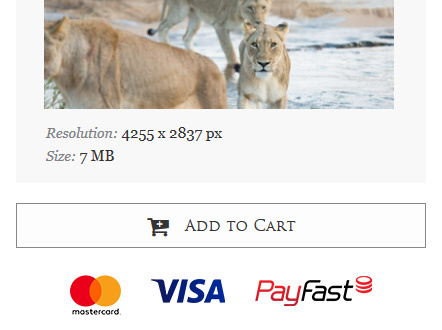 He was most likely trying to consume as much as he could before nightfall, when the hyenas would be most active. Indeed upon investigation the next morning, the hyenas had robbed him of the remainder of his prize. 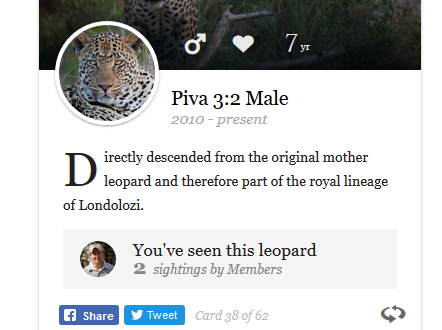 An interesting – although rather gruesome – development in the sighting was his discovery of a fetus in the nyala. It seems she was pregnant – and quite far along. Not the most pleasant sighting for us, but a reminder of the harshness of nature. 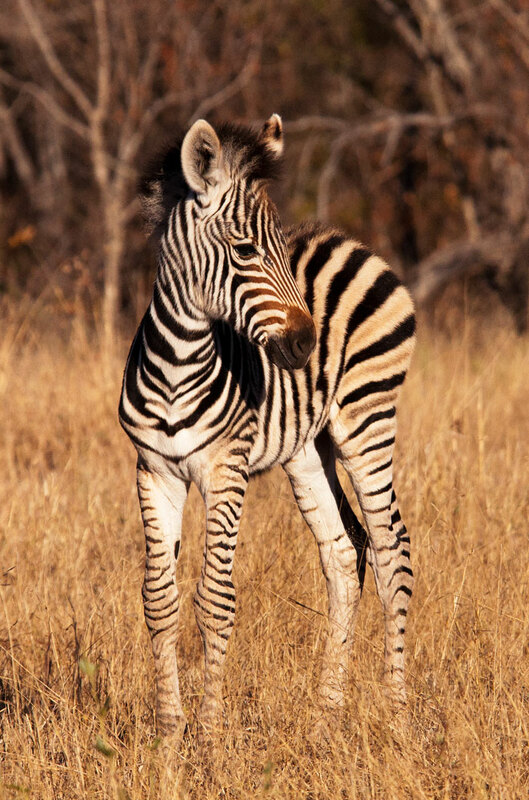 A young zebra foal enjoys the sunshine on Warren’s Crest. The week finished with an unbelievable sighting of the Camp Pan Male and Dudley Riverbank Young Male. 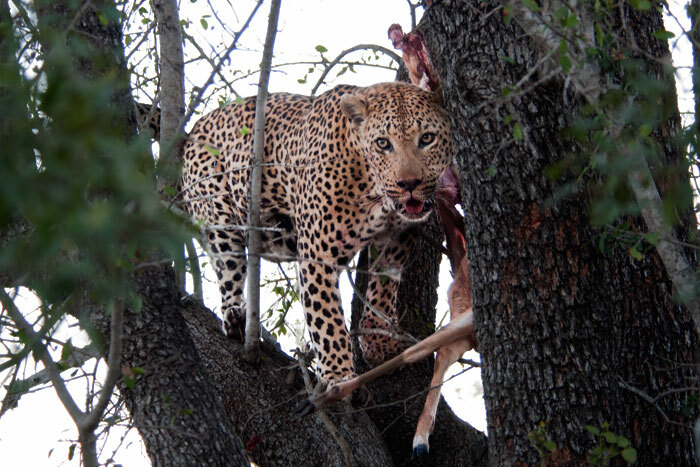 The youngster had made an impala kill a few days before which he had hoisted into a Tamboti tree. 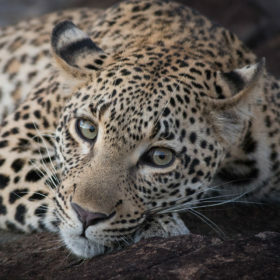 Unfortunately, however, Camp Pan had gotten the scent upon passing through the area and robbed the young leopard of his meal. In a flurry of growls, claws, teeth, and branches, the two chased each other up the tree and fought. 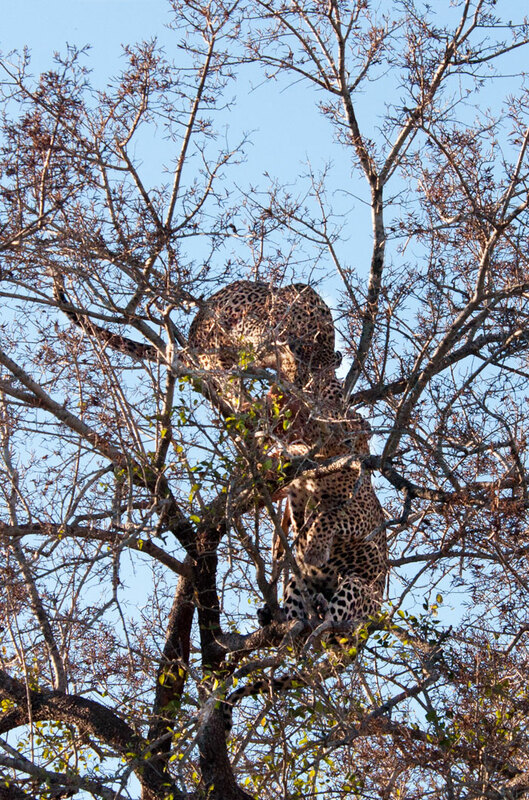 Being the larger and more dominant leopard, Camp Pan was victorious, and the Dudley Riverbank Young Male clambered down the tree – luckily unscathed. Staring down at him and growling, Camp Pan then began to feed. 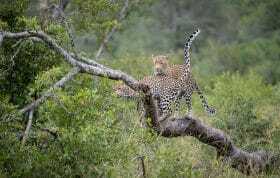 While feeding in the tree, he kept a close eye on the young leopard nearby. He did not try to challenge him again. 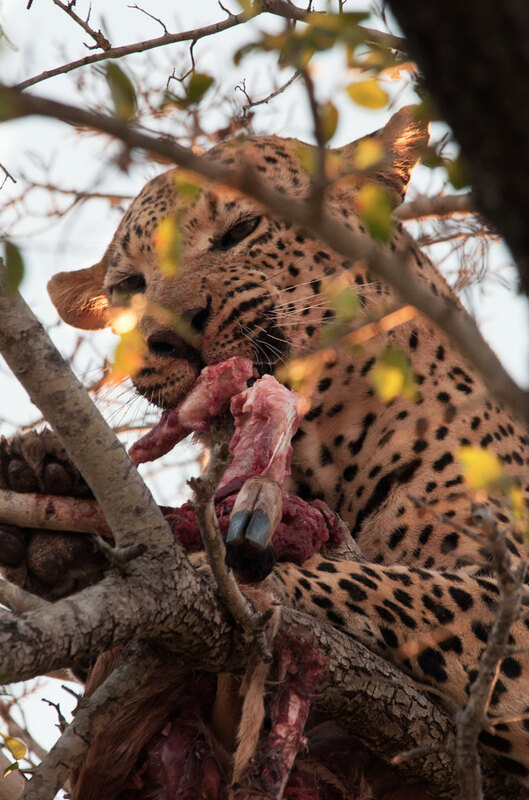 Then, as though showing off, Camp Pan brought the kill down the tree and fed on the ground, occasionally looking in the direction of the Dudley Riverbank Young Male and growling. 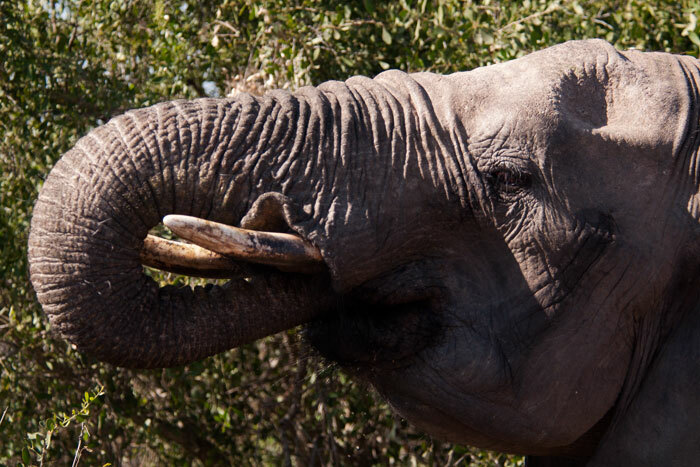 It appeared as though he was taunting him, although it is more likely that it was easier for Camp Pan to feed on the ground than in the spindly branches of the Tamboti tree. 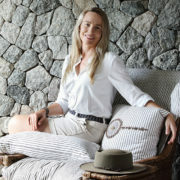 Thank you Talley for your wonderful update and photos it makes me so “homesick” for Londolozi. Thank you for a wonderful treat! Oh, how lovely, it’s just like being there. thank you for the wonderful updates.. what a fabulous week you all had with the animal sightings..
We really enjoy the window into your world. What a fantastic week. 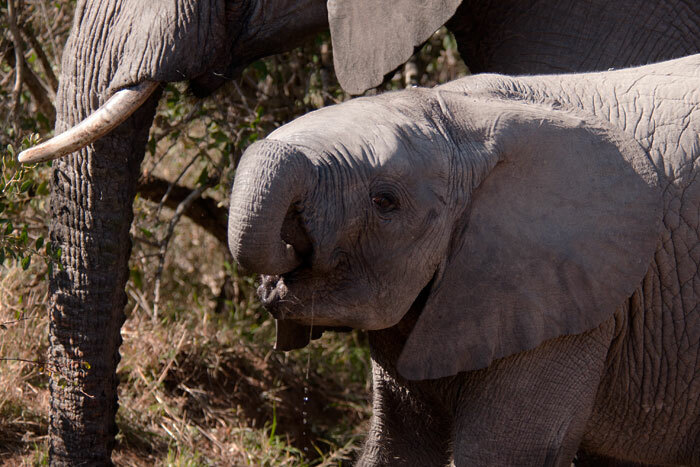 Especially getting to witness the new born elephant calf so close to your vehicle. That would have made for an awesome video. 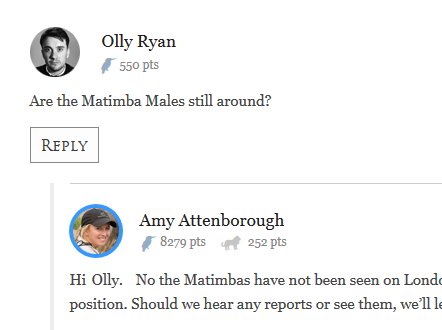 Too bad about the pregnant nyala. 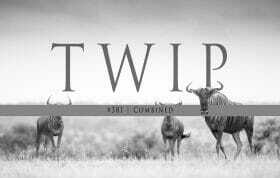 Such is life in the bush though. 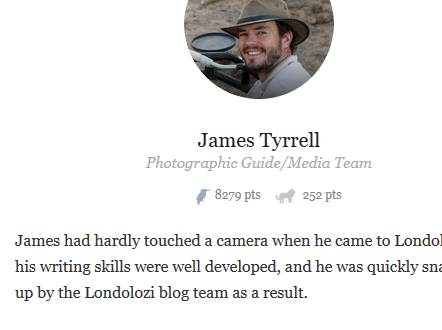 Thanks for the awesome photo blog. Those pictures are so beuatiful. Thank you. I wish I was there. Talley, the photos just get better! No joke, you have serious talent! The francolin camouflage reminds me of a female mallard duck I dropped in soy bean stubble once. I almost didn’t find it and then did so only by practically stepping on it. Love the great work! Each week I think it can’t get better…it does! Thanks. Wow Talley! What an amazing week and great pictures! 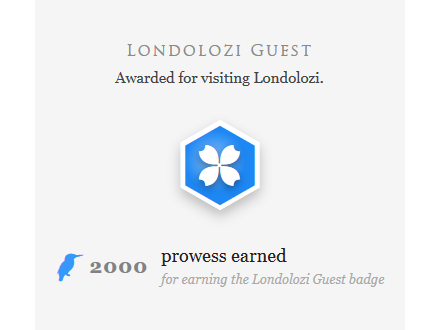 Thank you for sharing and look forward to the next game drive! Thanks again for your weekly update and great pictures! Wow!! 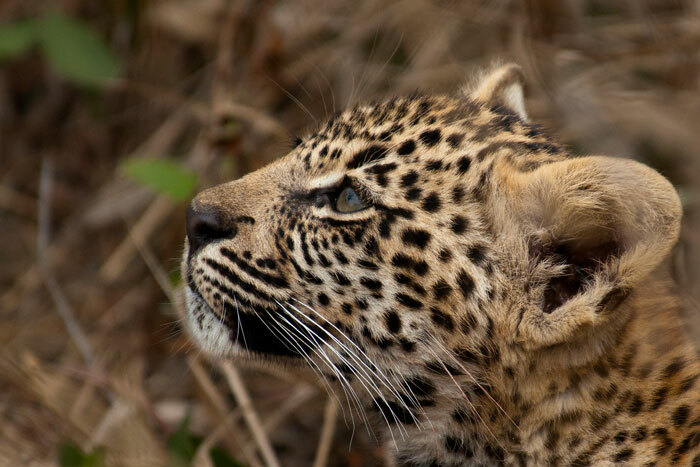 Amazing sightings………. very lucky to have seen all that! 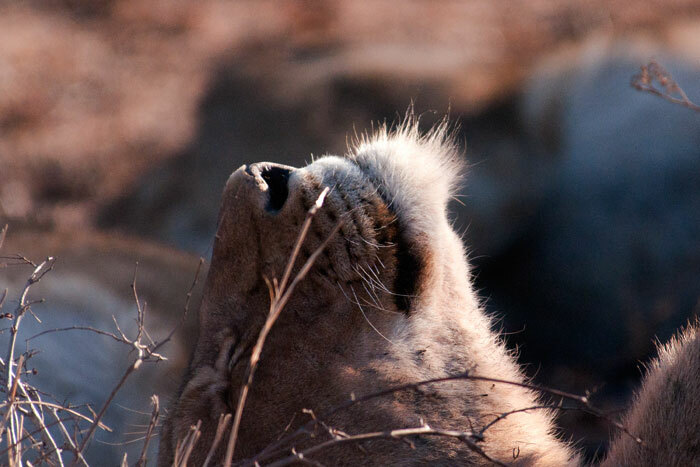 The one picture where you say young lioness looking for shade fooled me into thinking it was a young male with all that hair around the throat ……….. 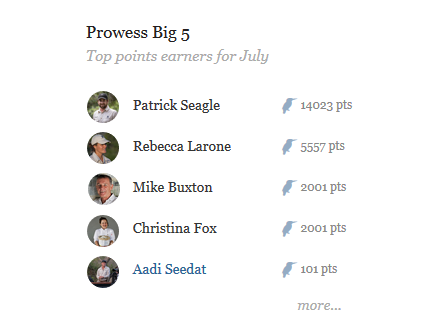 Thank You so much for sharing & I look forward to next week pics. 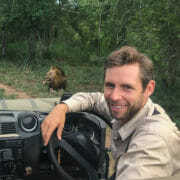 Strange that marthly male can’t hoist the nyala female. Fantastic photos and what amazing sightings! 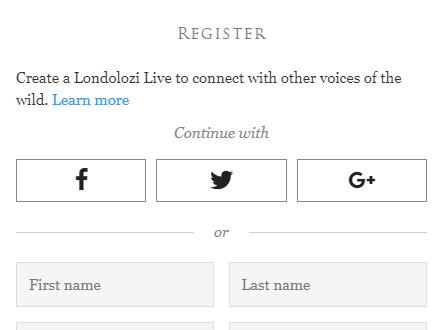 I too am homesick for Londolozi!! Thank you for sharing as always. Wow, what a week you had! 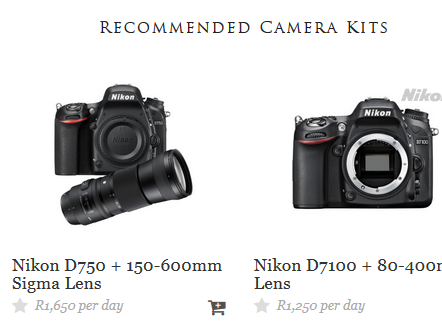 The elephant sighting must have been breathtaking! 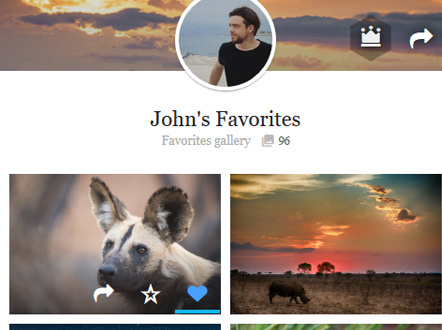 Thanks for sharing and the pictures were beautiful!